Southeast Chapter of the Community Associations Institute – Our firm has been an active member of the Southeast Chapter of the Community Associations Institute for many years, and for 2012 we are proud to sponsor the chapter’s annual golf tournament, which is one of its premier annual events. The tournament begins with a shotgun start at noon on Friday, Oct. 26, at the beautiful Jacaranda Country Club in Plantation, and registration, which costs $125 per golfer, starts at 11 a.m. Prizes and trophies will be awarded immediately following the tournament, which is always one of the best networking events of the year for the group’s members and guests. Click here to learn more and register to participate. Raise the Bar Silent Auction and Reception Benefitting the Women’s Fund of Miami-Dade – The firm was proud to be a corporate sponsor of the 2012 edition of Raise the Bar, the 8th annual silent auction and reception benefitting the Women’s Fund of Miami-Dade. The event, which took place on June 7, raises funds for the organization’s programs to empower women and girls through innovative initiatives that build equality, foster social change, and create community partnerships. Since 1993, Women’s Fund has awarded more than $3 million to a wide range of innovative programs that provide women and girls the skills and resources necessary to improve their lives. 2012 Mercedes-Benz Corporate Run – We were a proud supporter and participant in the 2012 Mercedes-Benz Corporate Run in downtown Miami on April 26. The event, which benefitted the American Red Cross, drew more than 22,000 runners to Bayfront Park for the 5k run, and the law firm’s team was very proud to take part. Pictured here from left to right are team members Erica Sefton, Stephanie Moeller, Johanna Ortega, Lindsey Pressner and Stephanie Bonilla at the start of the run. 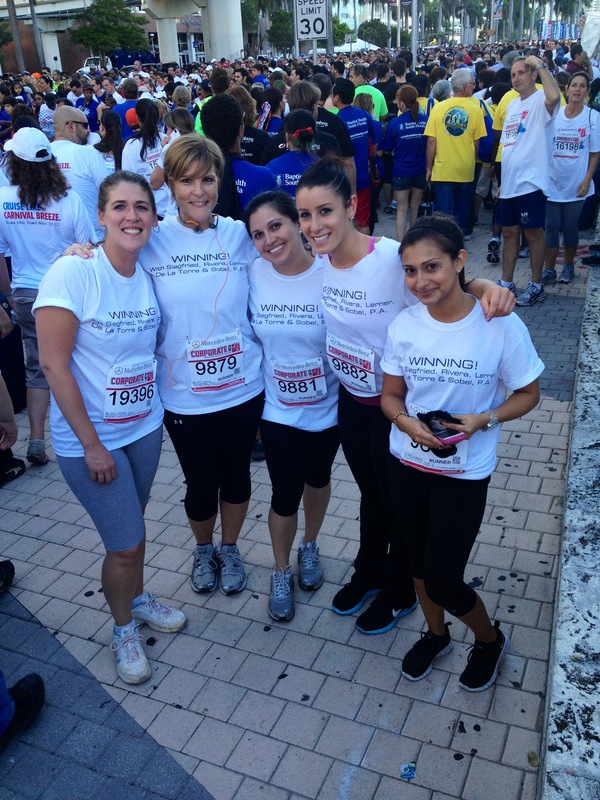 Crohn’s & Colitis Foundation’s Take Steps – The firm was proud to sponsor the Fort Lauderdale edition of Take Steps 2012, the CCFA’s largest annual fundraising event. The walk-a-thon took place on April 28 at Huizenga Park in Fort Lauderdale. The firm also served as the “Comic Relief Sponsor” for the Crohn’s & Colitis Foundation of America’s 2nd annual “Comedy Night,” which took place at on Feb. 16, 2011, at the Improv Comedy Club at the Seminole Hard Rock Hotel & Casino in Hollywood. The proceeds from these events benefit the foundation, which focuses on funding research to find a cure for Crohn’s disease and ulcerative colitis, and improving the quality of life of children and adults affected by these diseases. To learn more or sign up for the 2013 walk, visit www.cctakesteps.org. Click here to visit the Community & Industry Involvement page of our website to learn more about other events and initiatives that we are proud to support.